Prairie Fire Crabapple | Gurney's Seed & Nursery Co. Rounded 15- to 20-ft. tree presents an all-season extravaganza! First, prolific, pinkish-red blooms. Next comes new purple-maroon foliage, that matures to reddish green. Fall brings a display of red, orange and purple—accompanied by glossy red fruit. Fruit persists into fall or winter and provides food for birds. Resistant to scab, rust, fire blight and Japanese beetles. FormDeciduous. Rounded crown, upright growth. FoliageNew leaves emerge purple and turn reddish-green as they mature. BloomsSpring, 5 - 7 days later than many crabapple varieties. FruitGlossy dark red 1/2 inch fruit. Soil RequirementsWell-drained soil. Tolerates a fairly wide range of soil conditions. PruningPrune to remove suckers and watersprouts, prune as young trees to develop good branch structure. CommentsBeauty for all seasons. Prolific flower production in the Spring. 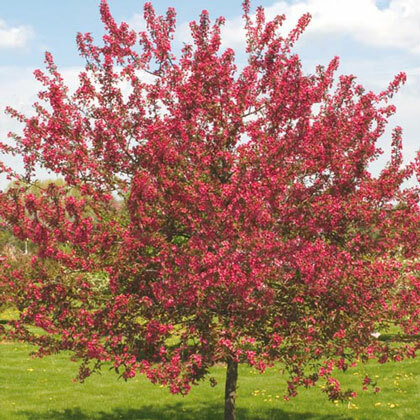 Blooms are very clear and bright, never muddy, new foilage is an attractive purple-maroon, becomes reddish-green and then red, orange and purple in the Fall. Red fruit is persistent into late Fall, even Winter- that is if the birds don't eat them by then. No littering problems, as birds relish the fruit and will eat it directly off the tree. RESTRICTED STATES, AE, AK, GU, HI, PR. 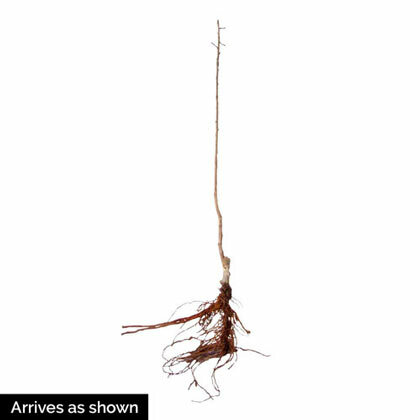 DepthPlant so the roots are below soil level and water thoroughly.